To the Tibetans the horse represents a very sacred animal. 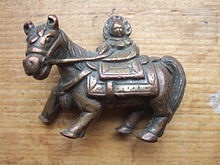 The Tibetan name is “Tasso” meaning Windhorse. The wind horse is an allegory for the human soul in the shamanistic tradition of East Asia and Central Asia. In Tibetan Buddhism, it was included as the pivotal element in the center of the four animals symbolizing the cardinal directions and a symbol of the idea of well-being or good fortune. It has also given the name to a type of prayer flag that has the five animals printed on it.